The Mahindra S201 compact SUV was recently spotted with production-spec bodywork. Now, an image of the car's interior has surfaced online. The spy image suggests that the compact SUV is likely to share its interior with the Ssangyong Tivoli. It has a dual-tone dashboard with silver trim around the centre console, which houses a touchscreen infotainment system. The SUV has a 3-spoke multi-function steering wheel and the seats are wrapped in cream coloured upholstery. 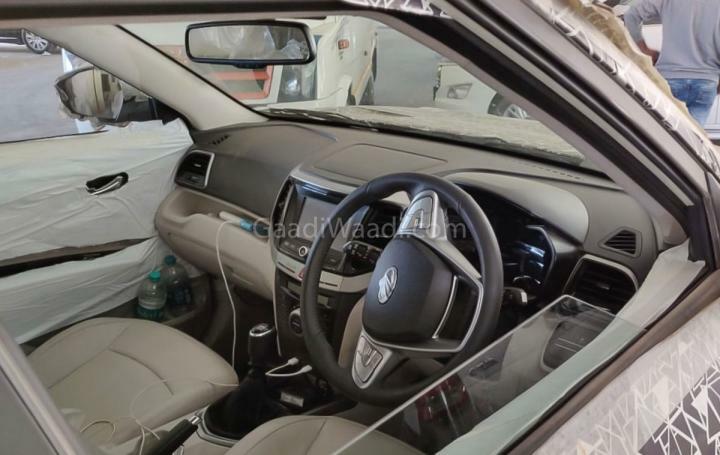 It is expected to get features like automatic climate control with rear AC vents, cruise control, sunroof, automatic headlamps, reverse camera, electric ORVMs among others. On the outside, the S201 gets a grille with vertical slats flanked by wraparound headlamps that have integrated L-shaped LED DRLs. While Mahindra hasn't revealed any technical details, rumours suggest that the S201 could be offered with 1.5-litre diesel and 1.2-litre turbocharged petrol engine options.